I believe that cash flow is one of the most powerful concepts in personal finance. People tends to know how they feel about their personal finance — e.g., whether they are comfortable or are struggling. Unfortunately, not too many people truly understand cash flow and how important it is to your finances. When you understand the concept of cash flow and know how to improve it, you give yourself tremendous flexibility and open yourself to a lot of opportunities. Cash flow is basically your income minus your expenses. 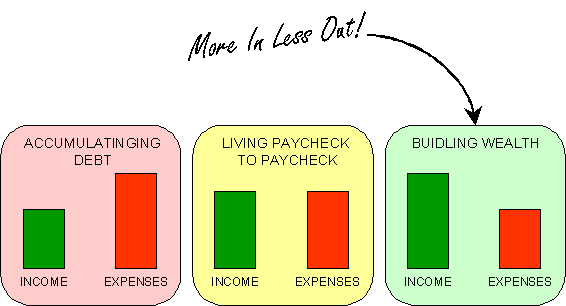 If your income is about the same as your expenses, you’re living paycheck to paycheck. If your income is higher, you’re in a good shape. And if your income is lower, you’re accumulating debt. Very simple isn’t it? And here is the beautiful part. Once you understand the basic components — income and expenses — you can begin to take concrete actions to improve your finances. And you can break down the problem even further by looking at reducing individual expenses and improving your income. The best and easiest way to improve your cash flow is by cutting your expenses; especially ones that are recurring month-to-month. The biggest bang for your buck is your mortgage, if you have one. Take a look at today’s best mortgage rates and see if it makes sense for you to refinance. Refinancing alone could free up several hundred dollars that you could use for other financial endeavors. In general, expense reduction is easier if you are keeping a budget. If you don’t have one, you should start tracking your expenses and start a budget. The key to success in expense reduction is doing all the little things that add up and trying to take one small step at a time. Don’t try to reduce your expenses by 50% — it will never happen. Challenge yourself to cut $50 a month or a $100 a month. Once you accomplish that, go for another $50, and so forth. To help you get started, here are some ideas on how to save money — actually, about a thousand ideas. The other side of the equation is improving your income. This is harder than cutting your expenses, but there are things that you could do — even little things like moving your money to a high interest savings account helps you to earn more. Again, it’s all the little things that add up. Earn more from your job — i.e., ask for a raise, get a promotion, work overtime, etc. Earn more outside of your job. Here are a few additional income ideas for you to mull over. Make your money work harder — i.e., investing in the stock market, real estate investing, and other alternative investments, etc. All of your transactions are automatically categorized, showing you where your money is going. You can click on the pie chart to drill down and see the detail for any category. 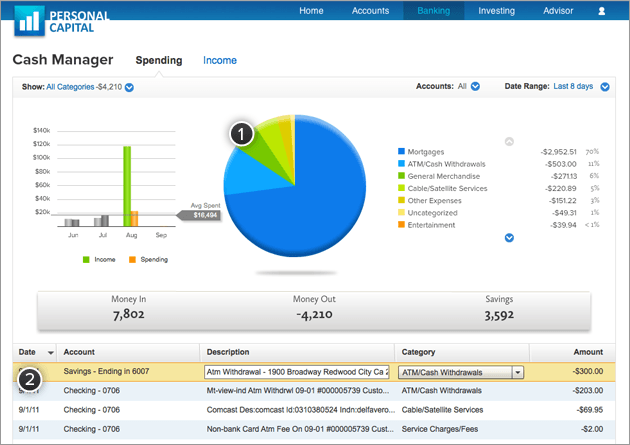 You can view, sort or search your transactions — all transactions from all your accounts are in one list. Pay down your debt — e.g., eliminate credit card debt, car loan, student loan, etc. As you do this, you’ll free up even more cash because you no longer have to pay all the finance charges and monthly payments. Invest your money. Again, make your money work for you and continue to improve your cash flow. Give. If you are in a position to give, charitable donation is also a great way to use your money. I hope you enjoy this article, and more importantly, got a few ideas out of it that you can use to improve your finances. You have to be creative. There are ways to increase your income. It’s only finding what works for you. Cash flow is a must, you can’t be in debt-you have to save or create more than you spend. Simple. Although I over spend on my home, waterfront, think its a great investment, so I can put the expenditure into 2 categories. Cash flow is what it’s all about. I tend to focus a lot of my investment strategy on investing in solid blue chip companies that pay dividends and equities that pay distributions. Even though it’s in a taxable account, it’s liquid and that’s important in a lot of ways. Controlling expenses is important, and should be a habit. Ideally, learned from childhood. I know, not everybody had these habits ingrained in them from early on:) But these habits can be learned, and we can train ourselves to live within our means and pay ourselves first. Inflow must exceed outflow, and the difference should be enough to build investments on. Very important, in my opinion, is maintaining your career and cash flow. You earning capacity is the engine that drives your ability to make the money that will be saved in the first place. Without the income, there won’t be anything to save and ultimately invest! A smart thing, in this environment, is to live well below your income level. In other words, try to minimize the % of your income that you actually spend. For example, in a 2-income household, living off one person’s income and putting away the other salary as joint savings is a good idea. In this way, if one person loses a job or quits, has health issues, or some other financial calamity hits – you at least have the other income and you can maintain your lifestyle. If single, this will be tougher but still try to live on less. Discipline, focus, perspective, long-term goals, and being aware of risks are all important attributes of someone who can truly build wealth instead of living paycheck to paycheck or worse, living in debt. I would like to think that most of us can learn and apply good habits for our own security and peace of mind. It amazes me how much in common running a business and personal finance are. Cashflow is a term generally reserved for businesses, but also needs to be applied to our personal lives. My theory on why everyone needs a budget is because successful businesses also have budgets. Simple article, but very educational. Increasing your income is not that easy – or else everyone would be rich. That’s why the most money comes in when you can spend less. It’s such a simple equation. Wealth = What You Earn – What You Spend. Yet, so easy to fall into bad habits if you aren’t careful. Cash is king. it is also a great way to not get hammered by credit cards. for about 3 years now i have been managing my personal funds through the use of cash. when you only have $40 bucks in your pocket its hard to buy that $50 shirt. thanks for the information great post.